This is not slapstick humor, but fantasy with a subtle humor or fantasy sprinkled with delight. Okay everything he wrote is delicious. But James and the Giant Peach is my favorite. All of the insect characters are so endearing. Witty dialog, kind and thoughtful James and those insects all play a part in a fantastic adventure. Not thrilled with the movie version. This go around, after the publication of immensely successful fantasy novels, the author is writing a bit of satire. Poking fun at everything fantasy. Great romp! Tourists sign up for a vacation through fantasy land. The sequel is The Year of the Griffin. Equally as good. I read Edward Eager’s books in the 1970s. First published in the 1950s, the books are available in paperback and ebook and some titles still in hardback. A 50th anniversary edition of Half Magic was published in 2004 with an introduction by Jack Gantos. Mr. Gantos writes, “There are some books that when read in childhood last a lifetime in the reader’s imagination, books so good that growing old doesn’t diminish the luster of their memory. “ Wonderfully put, Mr. Gantos. Great for the upper elementary and middle school set. Plenty good for adults. I re-read from time to time. Best known for her Inkheart series and The Thief Lord, Dragon Rider is a stand out book. It looks long, but that is because the book is thick and squatty. This is a dragon fantasy thrill ride. Firedrake heeds a warning to return to the ancestral homes or face discovery and extermination by humans. A smart-alecky brownie, and a human boy who serves as his rider, accompany him on his mission. Evil Nettlebrand wants to stop him. There is quite a bit to getting to the destination, most important is finding the map, drawn by a cartographer who is a rat. I listened to this story on an audiobook read by Brendan Frasier. I normally don’t listen to audiobooks as I am not a good listener. But as a fan of Brendan Frasier, who does an outstanding job, as good as the esteemed Jim Dale (see Harry Potter), this book made driving during a couple of road trips rather pleasant. This is another of those childhood books that I smile when I pull it off the shelves again. It won the Newbery Honor book when it was published back in 1948. The timeless story is still in print and all elementary students should be urged to read it. A young boy uses cunning to save a baby dragon. Lovely story. Amazing book. Every fantasy fan must read this. Goldman wrote the screenplay for the movie so it is equally as excellent. Example of brilliant dialog. Both of these books left me feeling serene, like all is right in the world. They are both gentle stories with lovely, caring adults. It gets a bit tiring when book after book casts the adults as the evil ones. Two of Ibbotson’s other books, Journey to the River Sea and The Star of Kazan are not fantasy but equally as good, if not better. The CIP lists adventure and historical fiction, but not so much historical fiction as adventure. Perhaps they go in a “really good books that just don’t fit into a category” category. I happened upon these books at a book store years ago, read one, then bought all I could find in the series. I can’t really describe these charming books adequately. They are quirky. Written in Finnish during the 1940s, translated into several languages, immensely popular in Europe and have a following in the US. I was shopping in a quirky novelty shop in Cambridge, MA, and found Moomintroll merchandise. 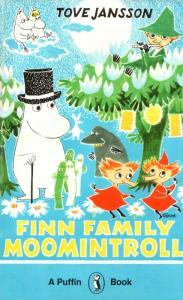 Look on YouTube for some Moomintroll animated clips. The books are much better. Delightful fantasy with so many enjoyable elements. Good vs Evil, orphan with special abilities, royalty, humor. This isn’t heavy, dark, or depressing – all of the characters are heart- warming including Nevery, the aloof but quietly caring wizard in charge of Conn.
and another to come . . . I have placed Magyk on the school reading list twice now. Each time, the book was immensely popular with students. When I snagged a galley of Darke at the Texas Library Conference two years ago, the students devoured the book, passed it to the next student and asked when the book after Darke will come out. Patience! That was April ’10, and they were clamoring for #7 when #6 hadn’t even been published. The characters are realistic in that everyone has quirky character flaws. It’s a good vs. evil scenario with plenty of characters – arrgh! So many to keep up with. Thank goodness for The Magykal Papers, a guide to the Septimus Heap books. Before each book in the series is available, I go through the guide to reacquaint myself with the characters. The writing is clever, dialog is snappy, and my – what adventures Septimus has. These books could easily be under the “Adventures” subgenre. *UPDATE – Book #7 – Fyre will be published in April 2013. The author is working on the Tod Hunter Moon trilogy that will take place 7 years after Fyre. Woopee! More books to come. Now, how to get galleys of these books . . . I know, it is not true fantasy and the CIP includes “virtual reality” and “science fiction” but fans of fantasy will also enjoy this book because the virtual reality game is fantasy based. I enjoy everything that Vivian Vande Velde writes plus – what a cool name she has! Okay, this book is about a girl in the future going to a virtual gaming center where she is hooked up to a virtual reality world to play a game. Oops – bit of a problem with the system and she must successfully complete her mission/goal/task or she dies. Super story telling. Patricia C. Wrede – Enchanted Forest Chronicles: Dealing With Dragons, Searching For Dragons, Calling on Dragons, Talking to Dragons. Cimorene is a common sense, down to business princess who declines the traditional vapid princess role. She becomes a dragon’s princess, refusing to be rescued. The books are charming and poke a bit of fun at fairy tales and fantasy. The series was quite popular when it was first published in the 1990s. Deserves to be rediscovered.